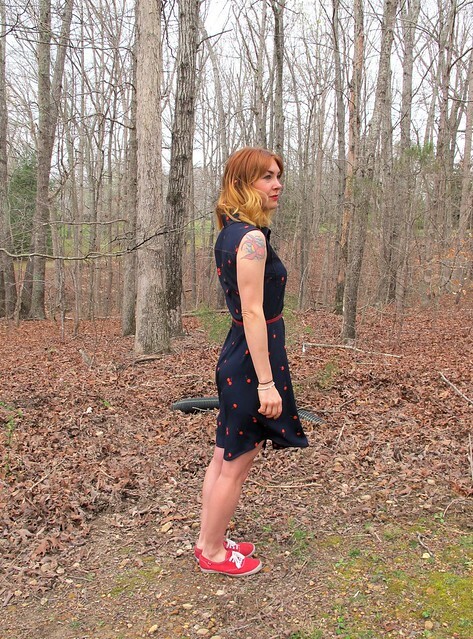 Lauren – what a lovely dress! I didn’t realize that Cotton & Steel made rayon fabrics?! So glad to know. 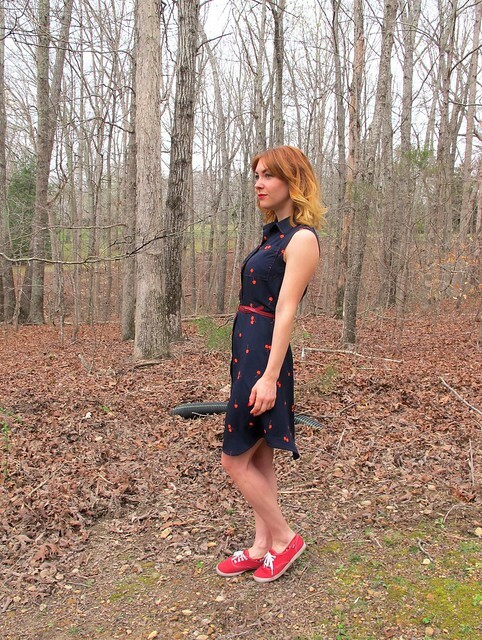 This dress will be perfect for spring/summer! Yeah they do! And the quality is really exceptional 🙂 yay for rayon in fun prints! Easy fix to securely secure that bust gap: make a buttonhole in the BUTTON side of the band, between the two buttons where the gap exists. 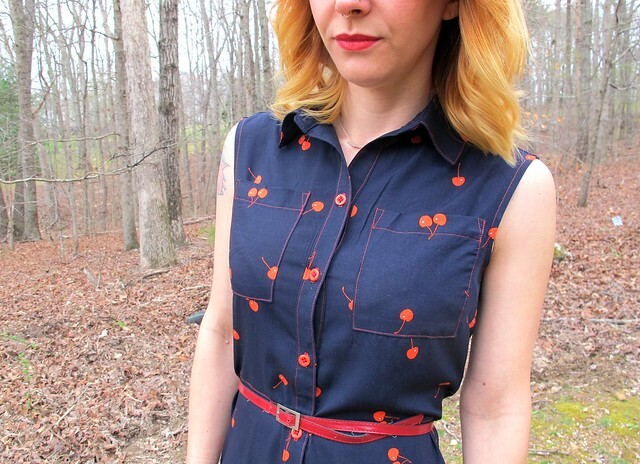 Put your button on the WRONG side of the buttonhole side of the band. Button to the inside — does not show when you are wearing the dress. Keeps dress securely fastened. This solution is old old old, probably predates the Gutenberg press. Possibly predates buttons. I’ve been doing this solution on a big chunk of my buttoned handmade garments 🙂 it’s a great fix when you can’t move existing button holes! 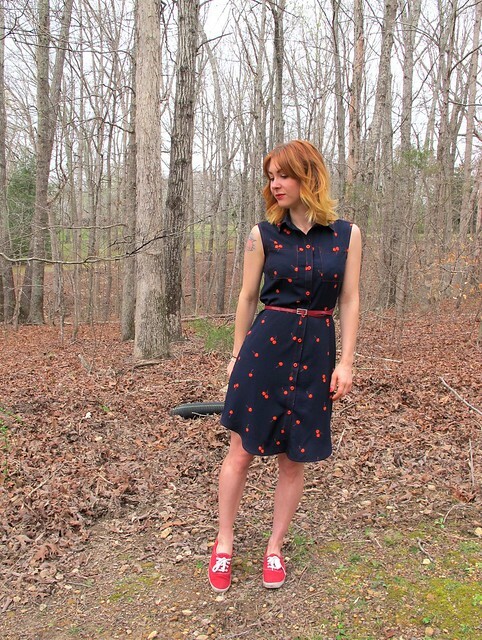 This dress looks great on you–they all do! 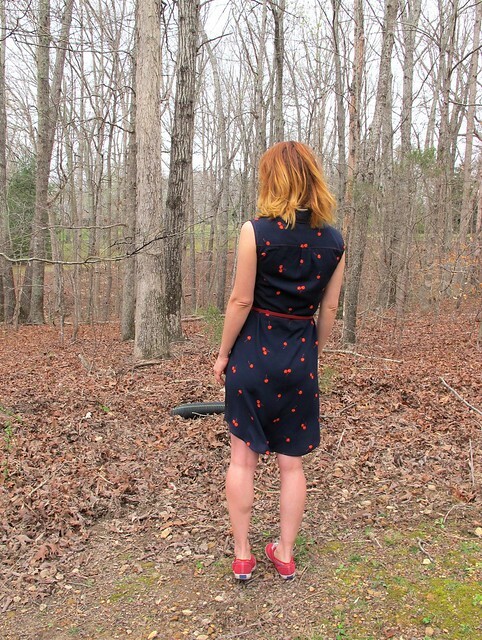 I LOVE the red top-stitching and perfect French seams. Thanks for this post. Checked out Style Maker fabrics. Love the fact that they allow me to search by garment type and color. Such an adorable print. Pairing it with the red belt and sneakers is perfect! Love the dress, such a cute print! And I like the red thread for the buttonholes. 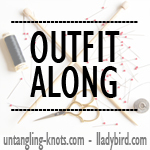 A newbie question for you–are there rules when it comes to buttonhole direction (vertical or horizontal)? 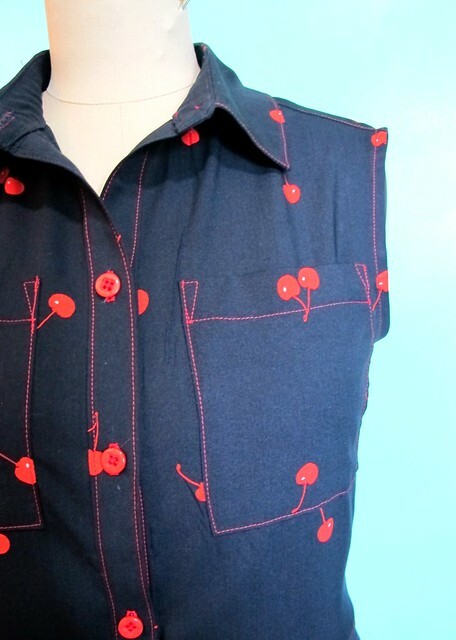 I am making a shirtdress (Hawthorn) and the pattern indicates all vertical buttonholes. Checking out other Hawthorns online, I see some in both directions. 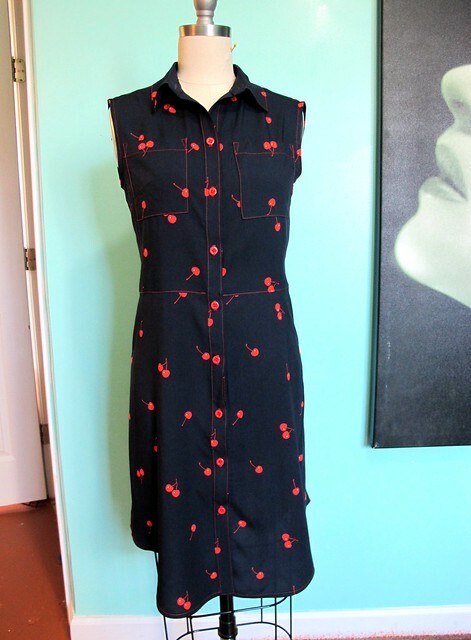 And would it be different for a different garment, say for buttons down the front of a skirt? No rules, it’s all a style thing. I’ve even seen diagonal buttonholes on some ready-to-wear (rtw) when the button band was cut on the bias. I’m sure that was to keep the buttonhole from stretching out weirdly, since bias is far more flexible than straight-of-grain. A mechanical reason you might choose horizontal over vertical is when there’s a good deal of stress on the button — as on a waistline closure, for instance (think jeans waistband, tra la) or on a tightly-fitted vest or jacket. 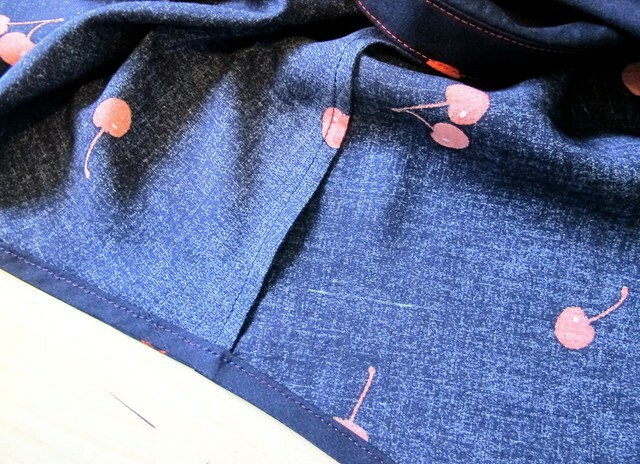 For the same reason, you might want vertical buttonholes to help keep a pocket flap buttoned — entirely depends on where the stress is likely to occur. 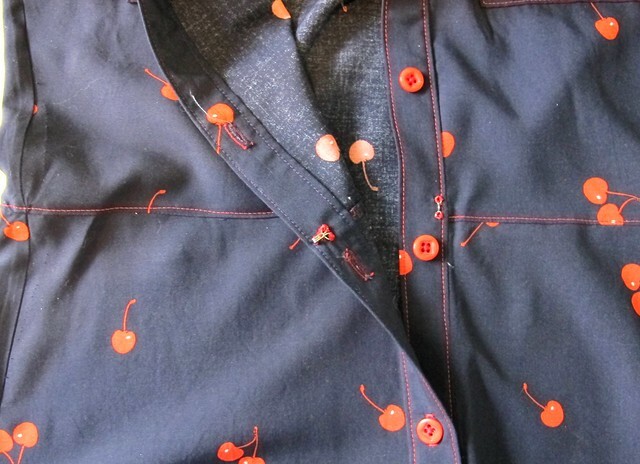 You don’t want the button to keep popping out of the buttonhole … Or maybe you do, I won’t judge you. Thus endeth the lesson. GURL THAT TOPSTITCHING THO. I love rayon too but agree with you that it is a PITA to work with. Also, I refuse to dry clean it (who has the time?!) and even with my gentlest washing I find that rayon gets fuzzy and pilly faster than my other garments! Maybe it’s just me mishandling it…but I do love to wear it so much! Haaaa I never dry clean anything! I just wash it in the machine on cold, and hang to dry. 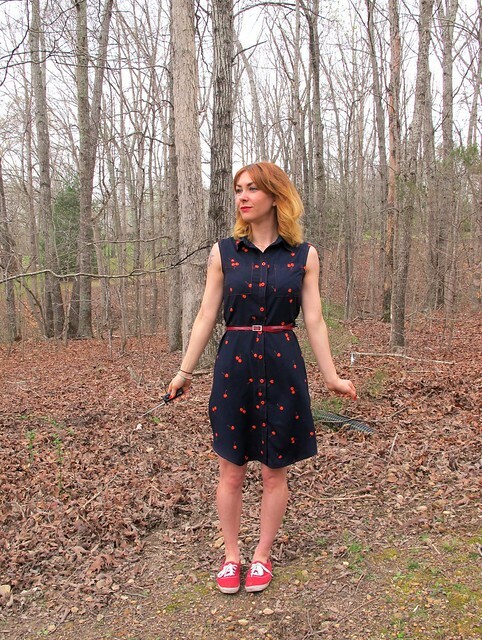 I don’t get pilling or fuziness with my rayon – are you putting it in the dryer? That will definitely shorten it’s life span (and also, you have to iron, which is lame haha). Either way, it’s worth it because it’s SO NICE to wear! Thanks for the review. 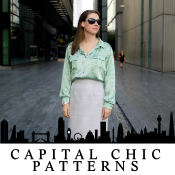 I really like the skirt options for this pattern and might have passed it up if I had you not blogged about it. Personally I think the bodice could use some vertical bust darts in the front. I get that it’s supposed to look casual but I think they would help with the waist definition and make a smoother transition. I’d probably cut in the arm holes a little for a slight racerback effect – I think it’s more flattering and would be especially so with well defined arms like yours. I think the pattern as-is works really well for this particularly drapey fabric, but I’d be interested to try your changes with something that has a bit more body. Could definitely look pretty cool! LOL…I can’t stop thinking about all things challisisis. 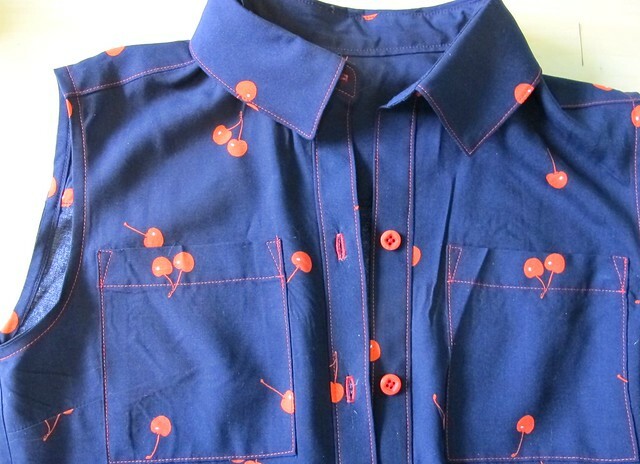 Anyways, you can’t go wrong with this cherries print…the silhouette of the McCalls pattern is perfect for it…and perfect finish with the buttons. Draftwise, you should try vertical dart to mark the waist. For men’s shirts they are not essential, but for women’s they smooth the side seams. Stylingwise, try closing the belt with a knot, it would ressemble to a cherry pair. As I’m like to play with leather, seeing you belt I thought about one a little larger one side red (cherry), the other black (navy), so the knot would have more effect. I n case you are wondering, you could ditch the pleat below the yoke. They are useful to offset the sleeve’s movement. 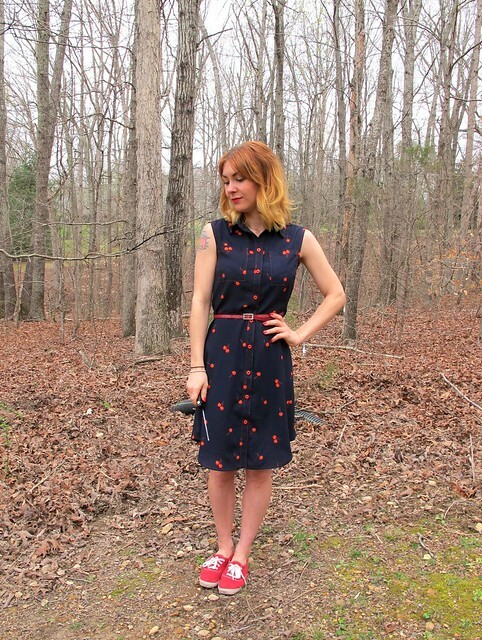 I love this dress – everything about it, even the looser waist for summer comfort! 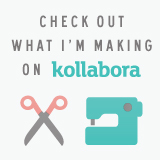 I want to copycat it – dare I buy anymore fabric? The rayon sounds awesome. I agree re the pleat below the yoke, but that’s one of my favorite things about this dress — so unexpected and “look at me.” This is such a timeless classic but with Lauren T. touches that make it most definitely “on [your] trend.” Love it! 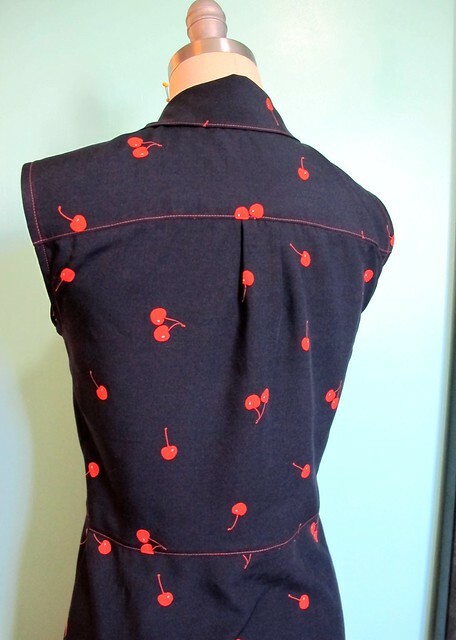 Is there a way to predict where the buttonholes need to go to avoid having to perform minor sewing surgery at the end? Thank you!! 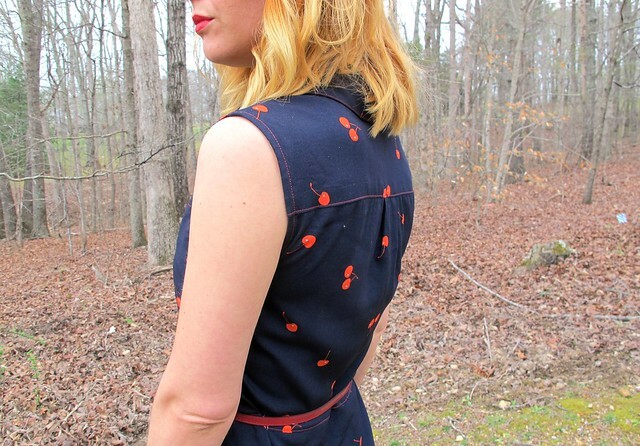 For button holes, you really just need to find the apex at your breasts – and put a button there. Then you can evenly space the rest of the button holes above and below it. As long as you get the button right at the apex, it should eliminate gaping. I love that dress! Super beautiful. This dress is gorgeous. 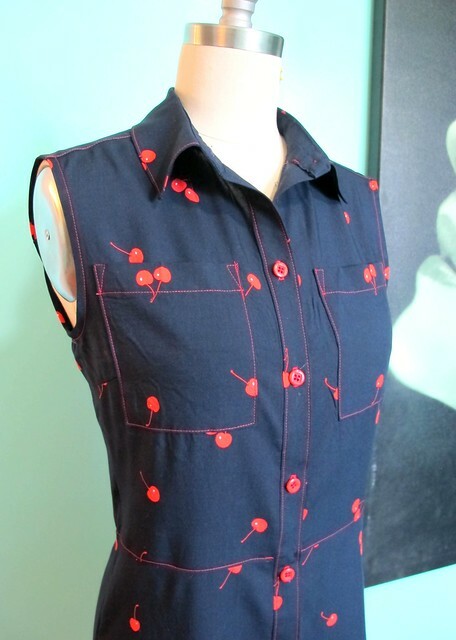 I love the fabric pattern and the details of the red top stitching and buttons. So perfect with the dress. 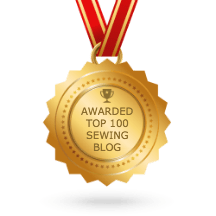 I am in awe of your top-stitching! It’s just beautiful and of course you have confidence in doing it using red thread! Yikes 🙂 This style just suits you to a t. A friend of mine who looks much like you was just saying the other day she’d like to make herself a shirt dress this spring so I’ll send her the link to this pattern. It has some nice extras like the shirt style hem that give it a unique look. I love that fabric and considered purchasing it on a recent shopping trip…now I wish I had. As usual, your construction details are so perfect, I’m inspired to up my game! Love Kevin and Wilbur. Well there’s always $5 shipping to fix that mistake 😉 haha!! I love cherries too! Yes, rayon rocks it has the fluidity of silk but it doesn’t stain as easy. 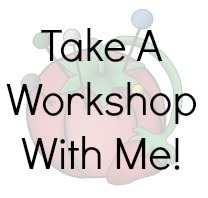 I love it that you are making something you like regardless of its a trend or not you need to be you right? Do you have enough for a self fabric belt? 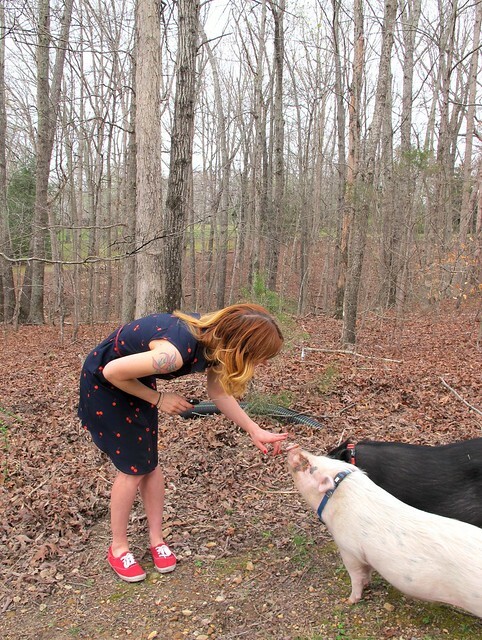 not that you can’t use the red one its just that it can be more comfortable to wear than leather (it’s my main reason for going beltless) Anyways…cute dress and piggies! I could make a self fabric belt, but I honestly think I’m over that style for the time being 🙂 I like the contrast of the leather belt! So pretty and so you! Your topstitching looks great…so nice in red. I love rayon too…you will get lots of wear out of this one! Lovely pattern and lovely fabric, oh yes. I have to do some research about rayon… is it a natural fiber? I love how it looks on you. And congrats on your piglet family!! I cannot imagine what are you going to do with so much pigs if not eating them (which I imagine you won’t…). I’ll check out those fabrics, shame I am no t in time for the shipping discount. Rayon is one of those ??? fabrics. Technically, it is manufactured, so it is a man-made fabric. But it is manufactured from wood cellulose, so … it is also a natural fabric. 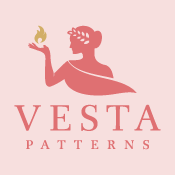 Other fabrics that come from the same or similar sources are: viscose (virtually synonymous with rayon), Tencel, and Lyocel. The actual make up of the fiber is natural, but the fabric itself is man-made, if that makes sense! Oo this is such a beauty of a dress! The kind of one that you wish you could own!! Beautiful!! I love your dress ❤ it fits you very well!